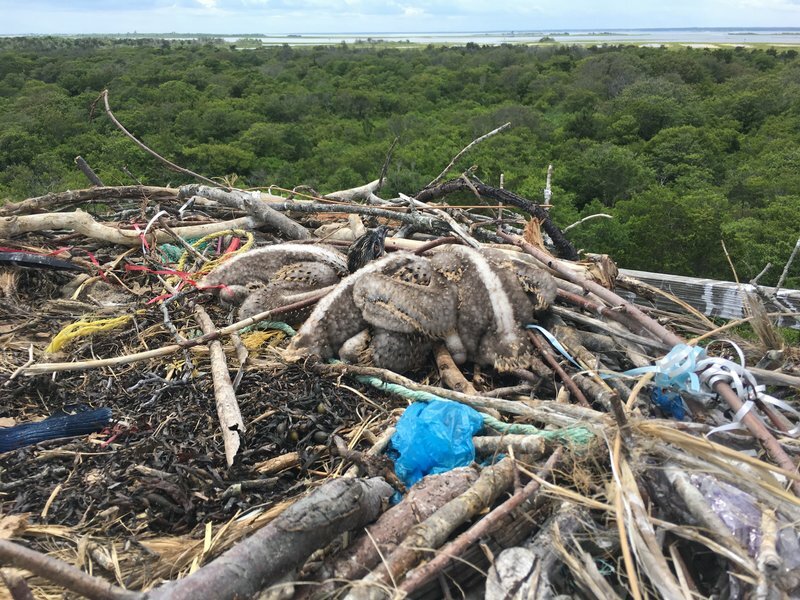 "Think before releasing balloons: Osprey tangled 35-feet up rescued at Shore"
These images and articles are contributing to the increasing call for a ban on balloons. The "California Power Outage" problem is no longer the biggest threat to our industry. It is the litter that balloons create. Local lawmakers around the world are banning balloons. It is imperative that the balloon industry take a Pro Environment position on balloon releases if we want our industry to survive! Then the environmentalists will work with us instead of trying to ban our product. Please agree to not do balloon releases and join the Pro Environment Balloon Alliance. See their website to sign up and get access to excellent resources. Check out their FaceBook page as well. Ben Wurst was at a meeting on Sedge Island, just off Island Beach Park on Barnegat Bay, on Tuesday when a coworker walked in and said a young osprey was ensnared in a ribbon that was attached to a balloon. Soon, Wurst would find himself 35 feet in the air trying to save the bird. Wurst, habitat program manager for Conserve Wildlife Foundation of New Jersey, knew this was not unusual at a time of year when balloons are released for graduations and other outdoor celebrations. The balloons drift over land before eventually popping and landing in the ocean or marshes. “Sadly, this is definitely something we see every year — an all-too-common occurrence,” Wurst said, echoing many environmental groups and communities fed up with the amount of plastic at the Shore. Last year, a Mylar balloon from Harriton High School in Lower Merion was found near Sandy Hook, N.J., during a cleanup coordinated by Clean Ocean Action, which counted 373,686 pieces of debris — 85 percent of which was plastic or foam. Other balloons have been on found on New Jersey beaches from as far as Indiana. On Tuesday, Wurst took out his cellphone and began looking at the nest through the Pete McClain Osprey Cam at Sedge Island. 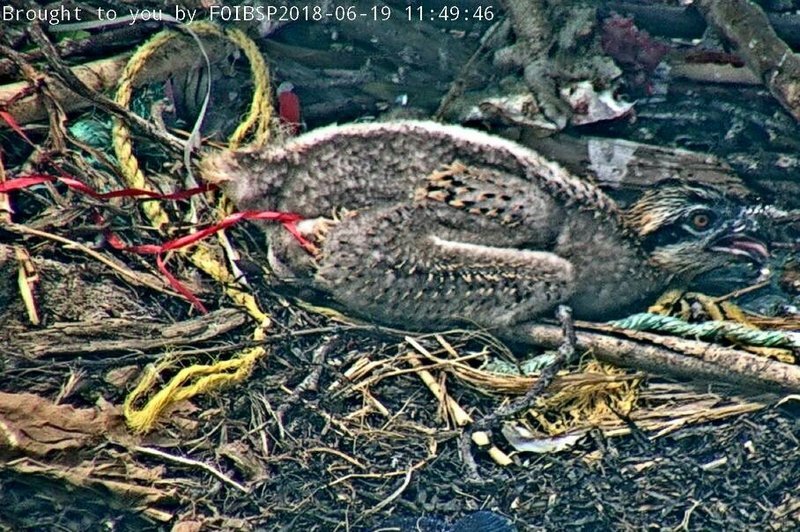 The balloon in the osprey’s nest was mostly shredded, but the ribbon was tangled on the three-week-old bird’s legs. Wurst said New Jersey has about 650 osprey nests. So he was fortunate he could see this one on video. Other tangled birds aren’t so lucky. Wurst and others called people they thought might help. Friends of Island Beach State Park eventually reached out from Seaside Heights. Its public works department sent out a cherry picker and Wurst climbed in. Wurst said that ospreys normally build their nests with sticks, grass, seaweed, and other natural material. But they also like to decorate the nests and are attracted to brightly colored debris, such as plastic trash that drifts in from the ocean and waterways onto beaches and wetlands. In this case, the bird was freed. However, by the next day, viewers of the osprey cam noticed new pieces of a balloon the birds had collected and brought to the nest.